Private 14' x 22' Professionally Maintained Pool and 3' to 5' in Depth (Seasonal Pool Heating Available w/ Fee), Oceanfront Covered Porch 1st Level & Streetside Covered Porch 1st Level, Private Walkway to Beach, 2 Exterior Showers, Paved Parking, 1 Parking Bay, 3 Covered, 4 Total Parking, Professionally Landscaped Grounds, Approximately 2,600 Heated Square Feet, No Pets Allowed. 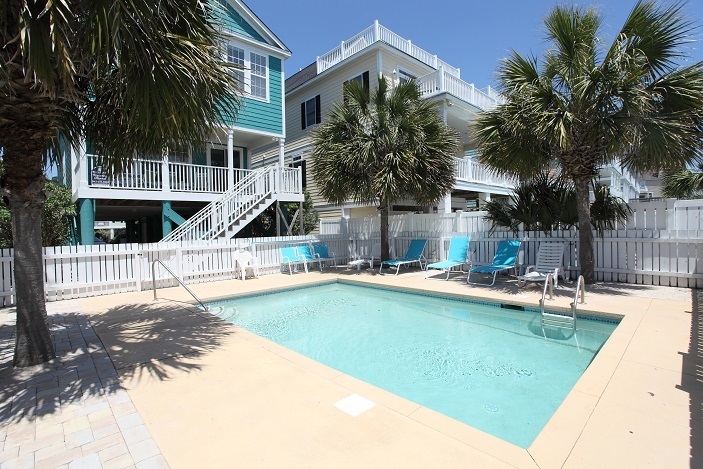 Professionally Decorated, Central A/C Heat, Ceiling Fans, Oceanfront Master Suite w/ Jacuzzi Tub, 6 Flat ScreenTVs, 3 DVD Players, Wi-Fi Internet, Washer/Dryer, Fully Equipped Kitchen, Refrigerator, Range/Oven, Dishwasher, Microwave. Me and my friends stayed here and we loved the property. The rooms were very comfortable and the property was beautiful. The house was Great so much bigger than pictures. Perfect location. The Sanderling House was great. Had everything we needed. The pool was cleaned several times the week we were there and was great.Very nicely furnished and the beds were extremely comforable .Nicest house we have stayed in. Wonderful location, right on the beach and a short 6-block walk to the pier and a few restaurants. House was well maintained and we loved being right on the ocean! We also rented Sun-S-Up, right across the street to accomodate our group of 24 ladies! Will definitely stay here again! We had a great week other than a little rain. The pool helped with that though! The house was perfect and had everything we could have needed. The kitchen was very dark to cook in, the built-in microwave above the stove was broken, and there was no fan in the kitchen. I believe the cost to heat the pool for perhaps four days should be discounted as compared to heating it for 7 days--in other words it should not be the full price. I, however, would still recommend the property. Management was wonderful to work with. Highly recommend the house. Wonderful beach and location was perfect for 4 adults needing a great vacation. Pool does need a little rehab but was acceptable. Loved the decorating... pleasing atmosphere. A few minor issues were immediately corrected...thanks to the management!!!! Definitely would consider renting unit again. Thank you very much, glad you enjoyed your visit! This was a great vacation and we will stay in the area again. Thank you for completing the review. We appreciate your feedback! The house was very adequate for our needs. Parking was a bit slim for 5 couples. It would have been nice to have ceiling fans in bedrooms as we felt the rooms were warm at night. Would definitely stay there again. Great. Enjoyed the area quite a bit as did my family. Traveled very little that week, partly due to the brutal traffic. But really no need to leave the rental. It was great. Glad you enjoyed and regret any inconveniences during your stay. CONGRATULATIONS!!! We are so glad you enjoyed your time here! This was our second year at Sanderling & hope to come back next year. Had a few miner things to be fixed, but they were there right away to corect them. Love the location. Comfortable beds. Great configuration. Kitchen could have been better equipped. Microwave left hot and cold spots when warming foods. Overall a great house. Very clean. Realty company was super easy to work with. The house was clean, comfortable and decorated beautifully. Everything needed in the kitchen was there. The staff was friendly and helpful. Would stay again. The Sanderling is a nice house with a good location. We enjoyed our stay there. Great, but the ice maker did not work and the pool furniture was damaged. Thank you for completing the review. Home services will check on the ice maker. This was a very nice vacation home. The only issue we had were with the amenities provided. We had several deck chairs broken which we reported on the first day. They quickly came and picked up the broken chairs but they were never replaced. The washer hot/cold are hooked up reversed. The ice maker dispenser did not work. But the house itself was in excellent condition and very nicely furnished. Thank you for your comments and we apologize for any inconvenience. The house was gorgeous and it was in the perfect location. We had a couple of small issues but the property management company promptly took care of them. My only suggestion would be better landscaping and general maintenance around the pool area. Thank you very much for your kind comments and suggestions.